Darvon is a narcotic medication that is approved for treating mild to moderate pain in adults. Rather than working directly at the site of the pain, Darvon works in the brain and spinal cord. This drug is not typically a first choice pain reliever as it is considered a weak narcotic. Due to Darvon being a narcotic, over time the body becomes accustomed to the effects of the medication. If Darvon is stopped too quickly, withdrawal symptoms may occur. These symptoms can occur with chronic, legitimate use of the drug as well as with Darvon abuse. Withdrawal is the normal, predictable, physical response to stopping the medication, although it is certainly more likely to occur in cases of Darvon addiction. Withdrawal from Darvon can be extremely unpleasant. It can be so uncomfortable that people start taking the medication again in order to relieve the withdrawal symptoms. What are the withdrawal symptoms of Darvon? The withdrawal symptoms of Darvon include: anxiety, sweating, insomnia, shivering, pain, nausea, runny nose, shakiness, diarrhea, goose bumps, cravings for Darvon and flu-like symptoms. 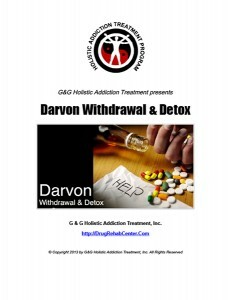 When Darvon use is stopped abruptly, these withdrawal symptoms can be severe. Persons who are addicted to Darvon usually enter a substance medical detox in which the withdrawal effects and the symptoms can be minimized at a safe and steady pace under the supervision of a medical doctor. This kind of medical drug detox program has been proven safer, faster, and more reliably comfortable than all other systems currently in use.